The Wellington Dukes beat back a nemesis on Friday evening but had their four game winning streak snapped on Sunday. The local Ontario Junior Hockey League squad topped the visiting Lindsay Muskies on Friday night at Lehigh Arena 4-1 but fell apart in the third period of Sunday afternoon’s contest in Markham, dropping a 5-2 game. 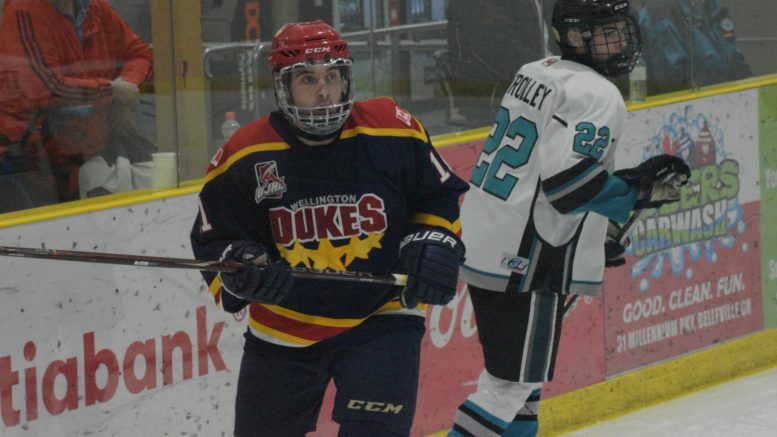 Through more determined and structurally sound play, particularly in their own end, the Dukes (14-12-3) have managed to re-insert themselves in the jockeying for prime playoff positioning in the East division and trail division leading Trenton by just four points. On Friday, Wellington was able to get off to a strong start against the Muskies and made sure the visitors from Lindsay had no plans of upsetting the locals for a second consecutive visit to Prince Edward County. Andrew Rinaldi’s powerplay goal just 3:20 into the contest put the Dukes ahead 1-0 as the Montreal speedster cruised through the slot and banged home a rebound past Lindsay starter Blake Curran. Later in the first, Frank Vittuci would surprise Curran with a shot from half wall and stake Wellington to a 2-0 spread at the 15:25 mark of the first. Early in the second, the Muskies would take advantage of a powerplay as Patrick Goan drove the Wellington net and banged home a nice cross-ice feed from Braydon Leeking at 1:25. After playing the first period in the Lindsay zone, the Goan volley was just the third shot of the game on the Wellington net. But if Lindsay had any hope whatsoever of turning the tide, they were dashed late in the frame as Dylan Massie stripped the puck off a Muskies defender down low and beat Curran to the glove side at 13:15. In the third, Wellington nursed the lead and were able thwart the Muskies for most of the frame. Inside a minute left in the stanza, Vittuci took a long shot at the vacated Lindsay cage and the puck trickled in from long distance, giving the winter his second of the contest and finalizing the scoring at 4-1 in favour of the hosts. On Sunday, Wellington and the host Markham Waxers played to a 2-2 draw through forty minutes with Daniel Panetta and Elijah Gonsalves scoring powerplay goals in the first and second period, respectively. But Luca Esposito goal early in the third would give the Royals a lead they would not extinguish. Up 3-2, the OJHL’s current version of Espo put a cap on the afternoon bagging his hat trick goal past Wellington starter Olivier Lafreniere at 17:41 to ice it for Markham. A Justin Bennett goal came with Lafreniere on the bench for an extra attacker and made it 5-2 Markham. Wellington heads to Kingston on Thursday evening to play the Vees and then returns home to welcome County native Jett Alexander and his North York Rangers on Friday night. The game could be Alexander’s last appearance in a Rangers uniform for some time as the local product was among the players from eastern Canada to suit up at the Team Canada East training camp next week in Oakville. Wellington Duke defenceman Zach Uens was also invited to participate at the training camp although the Belleville native has been on the shelf since late September with a wrist injury and his status is unclear. Wellington finishes up the weekend with a Sunday matinee game in Trenton. Leads at Lehigh: Wellington released netminder Dannick Francouer late last week and used both Matthew Maas and Sam Dingle as back ups Friday and Sunday, respectively. Both are current Quinte Red Devils and the club will likely be sourcing a new permanent netminder as the Dec. 1 roster cut down date.